As creative individuals we always face challenges with different requirements with our schoolwork as well as our careers. We need to be flexible in order to fit in certain subjects into advertisements and layouts. We must provide the right amount of information but also make it look interesting enough to get people’s attention. 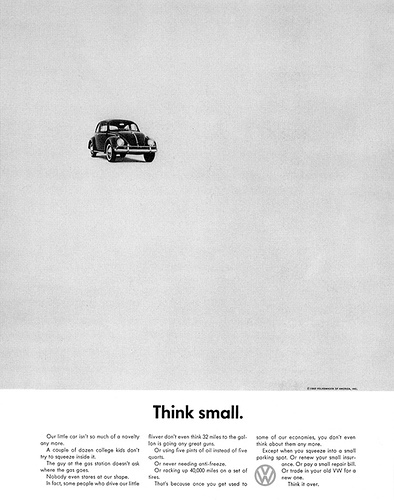 We all know the infamous Volkswagen beetle advertisement with the use of white space. Created in 1959, they used a white space effectively to create depth and an interesting perspective. As designers, we need to choose the right design and layout with images as well as copy. But in some cases, there is no need for any copy or even no imagery. If used correctly, it can be as effective as the “Holstee Manifesto” poster. By using typography, the design elements are very interesting with varieties sizes and fonts. But when creating these elements, how much is too much? In the current issue of GQ (February issue), there was a layout of how betting becomes a popular part of the super bowl. On the last page of GQ, the parting shot, it showed an in-depth layout of other things you can possibly bet on instead of betting on who will win the super bowl. There are funny little notes and phrases about things that are predictable. For instance, one of the funny phrases says, “Peyton Manning will be in a skybox, eating chicken fingers. Yes or no”. These questions are there to entertain and to get their mind off of the actual super bowl game. However, if you see the image, you can see that there are so many different boxes with rules and colors. There are varieties of strokes, thickness, and sizes within the text and it can seem a bit overwhelming. To make certain things that have a large amount of text can be hard to make look interesting. Is this layout interesting enough that people will read it? When I first came across it, it was like the world of design decided to throw up everything on paper because there were too many colors and it was a bit distracting. But, the actual words were interesting enough for me to actually read through the whole page. How much is too much? In this case, I think this is too much.